Wow, talk about a loaded question! First of all, it would be impossible to say what the best memory foam mattress is, because much of what goes into the correct answer would be subjective. 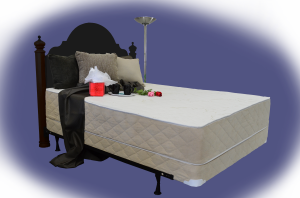 If you’re looking for a total luxury experience, you would obviously choose a different mattress than someone who is just trying to put an end to back, neck or leg pain. Also, I'd have to know if you sleep on your back, side or stomach. If you sleep on your back, you're probably going to want a little firmer feel than a person who sleeps on their side or stomach. A back sleeper has much more of his or her body in contact with the mattress, so there is less tendency to develop pressure points that cut off circulation and make you want to toss and turn all night. Although a back sleeper usually prefers a firmer mattress, it’s not necessary to have one if you’re sleeping on memory foam. This is because it’s not the firmness of the mattress you need but proper support. Since memory foam has the ability to support you, a softer mattress won’t end up giving you back trouble. Selecting too firm a mattress for a side sleeper will undoubtedly lead to some discomfort in the shoulder and hip areas where most of their weight is supported. If you sleep on your stomach or a combination of different sleep positions, you'll have to consider such things as the pressure on your stomach or breast area and how that will affect your comfort. Now, add to that how tall you are and how much you weigh and I'd come up with several answers as to which is the best one. Let me answer a couple of concerns and then I will take a stab at suggesting what I feel is the best memory foam mattress. Fair enough? It will be a great help in selecting the best mattress choice for your unique situation. If you're less than six feet tall and weigh over 220 lbs., you should definitely consider the best choice to be one that has more than the 3 to 3-1/2" of memory foam. I recommend 4" to 5" of quality memory foam over the polyurethane base foam if you are in that weight category. The main reason for saying this is when a person of that weight rolls over at night, they might tend to rise up on their knee or elbow and "bottom out" on the underlying polyurethane base foam. That might wake them up from a sound sleep. On the other hand, if you're less than 160 lbs., you would probably be happy with a top layer of memory foam that is only 3" thick. Depending on your preference for a firmer or softer mattress, I would recommend accordingly. Other factors such as the country the foam is poured in and the density of the foam are critical to choosing the best memory foam mattress because of toxicity and credibility concerns. These things are covered in detail in a video you can watch by going to memory-foam-mattress-store.com. If you're just looking for the plushest, most luxurious mattress on the market, I would tend to recommend the Grand Bed(R) by Tempur-Pedic™, as one of the best memory foam mattresses overall. The biggest drawback is that at $6,399.00 in queen size and $6,999.00 in king, most people just can't afford to pay that much money for a mattress. Wouldn’t you agree? A couple of other concerns about the Tempurpedic™ mattresses are the egg crate layers they use for their air-flow system. I’m convinced that egg crate has no place in any memory foam mattress, much less one that costs as much as they get for theirs. If you had to choose one component in a mattress that would break down the quickest, wouldn’t you agree that the egg crate is probably it? When the egg crate breaks down, your mattress will break down and you’ll be faced with buying another expensive mattress to replace it. Wouldn’t it make much more sense to use open-celled foam throughout the mattress to cool it and maintain the integrity of the mattress? I sure think it makes sense. Also, with all the advertising that they do, they have to add that into the price they charge you for a mattress. So you’re not paying for the best materials necessarily, you’re paying for all that advertising. 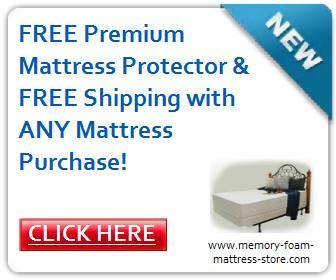 Another thing that they are doing now is making mattresses with different densities of memory foam in them. Because they’ve discovered that people prefer the softer-feeling mattresses, they combine lower-density materials in their mattresses to give that softer feel. The problem with lower-density materials is that they don’t last as long as the higher-density memory foam. This means that material will wear out sooner and you’ll be faced with replacing your whole mattress at a cost of multiple thousands of dollars. My recommendation is that you find the softest mattress you can find but still in the 5 lb. density memory foam. If you find that you still want more softness, you can just add a 2” memory foam mattress topper in a 4 lb. density and you’ll get the soft feel you're looking for. After 5 or more years when the topper wears out, you can replace it for a couple hundred dollars instead of several thousand dollars. Does that make sense? It’s what I recommend. To help you further, I've taken the time to compile a list of the most popular models of Tempur-Pedic mattresses and done comparison charts so you can readily see the major differences in them. All things being equal, it might just boil down to pricing so that would definitely be a consideration as well. If you can buy a mattress of higher quality at about half the price, that would make a lot of sense, wouldn’t it? Now you know why I said the best memory foam mattress is more than one mattress selection.